A new wave of mine expansions happening in Nunavut is expected to bring along with it a lot of jobs and economic spinoffs says a report on CTVNews. 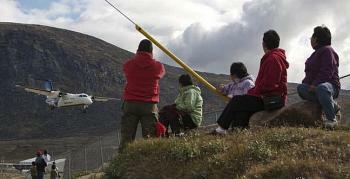 "Inuit are very eager and wanting to participate in the economy," said P.J. Akeeagok of the Qikiqtani Inuit Association. The associationhad just in recent times, signed an agreement with a mining company that has a billion-dollar expansion proposal before northern regulators. The mining company, Baffinland's Mary River mine on the northern end of Baffin Island is considered one of the richest iron deposits in the world. In addition to the above, a Quebec-based company, Agnico-Eagle has started pouring gold at its new mine near Rankin Inlet, the company is also developing another deposit nearby. These two projects are said to represent about $1.6 billion in investment since 2017. Agnico-Eagle is expected to hire new employees for this project. "We're going to get close to 700 people by the end of the year," said Dominique Girard, the company's vice-president for Nunavut. Northern employers have always had a hard time living up to their promises of increased jobs. Agnico-Eagle made promises to improve Inuit employment levels by 50% but has only succeeded in achieving 37%. Baffinland also has a similar target, however, only about three hundred of its one thousand two hundred employees and contractors are Inuit. Sometimes the level goes as low as 14%. The article quotes a study commissioned for the environmental group Oceans North which concluded that the gap between Baffinland's targets and its actual employment would amount to about $1 billion in lost wages for Inuit over the life of the mine. The study states that this would be especially so if the proposed expansion resulted in increased production before more Inuit could be trained. "What is the case for massive expansion of the mine before the labour market can keep up with it?" asked Chris Debicki of Oceans North. "The rapid scaling up of this mine, as proposed, will not maximize Indigenous benefits." But Akeeagok and Gabriel Karlik another member of the Kivalliq Inuit Association quoted on CTVNews say strengthened promises of education and training will get local people into the workforce. "The Kivalliq Inuit Association is working with stakeholders, including Agnico-Eagle, to ensure that Inuit are in a position to take advantage of available opportunities in training and upskill development," said Karlik. Baffinland also ran a five-day program about work issues which focused on managing finances and the strains that work can put on families. In the program, recruits are made to sit in a classroom and observe current employees. "That helps long term with retention," said Baffinland vice-president Grant Goddard. Agnico-Eagle, on the other hand, has established a work and training approach that helps Inuit to progress along a career path of operating complex machinery. "All of our entry-level positions are 100 percent Inuit," Girard said. "But when we get into semi-skilled or skilled, this is where we're having more difficulty." "We'd like to develop more leaders," he said. "We'd like to have our mine managed by Inuit."